When it comes to DIY, there are few projects that won’t involve some form of drilling. Every homeowner needs a reliable drill and drill bits so that they can take on all kinds of different projects with ease whether they are hanging a photo or installing a deck in the garden. Of course, there are many different types of drill bits and it is important that you are familiar with these so that you can easily select the right one for the job. If you are going to be drilling in wood then it is best to use brad point drill bits for a clean hole. These drill bits have a long centering tip with two pre-cutting spurs which will score the wood fibers with the internal cutting edges cutting them out cleanly. If it is a non-ferrous metal (aluminium, copper, iron etc) then HSS (high-speed steel) drill bits will be the best type to use. These drill bits can also be used for hardwood and plastics too which makes them versatile and a great addition to any toolkit. Any masonry with made of brick, clinker or concrete will require the use of an impact drill or a rotary hammer with a masonry drill bit. The best thing to do is to purchase a high-quality drill bit set from a specialist like RS. This will provide you with all of the drill bits that you will need to take on all kinds of different DIY projects around the home. If you are ever unsure on what the best type of drill bit to use is, follow the above information or look online where you should be able to find the information that you need. 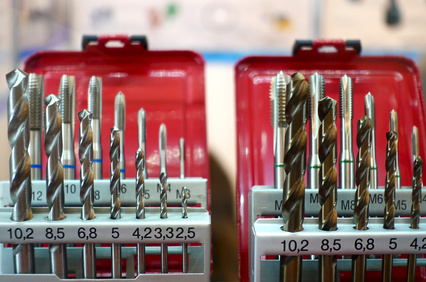 In addition to a drill bit set, it is also important that you have a high-quality drill. Cordless drills are a great option as they are easy to use as well as powerful which allows you to take on all kinds of work. Additionally, variable speed control allows you to drill with complete precision. Drilling is a huge part of home DIY and most projects will involve some form of drilling. It is vital that you are always using the right drill bit for the material that you are drilling through in order to drill a clean hole and so that you do not damage the material and the drill bit.